Each spring we anxiously await the arrival of beautiful Western Bluebirds, hoping they will choose our nest box to settle in. Again this year they came around and inspected the digs with the female beginning to fly in with nesting material. And, again for the second year in a row, a Plain Titmouse got wind of the operation, rushed in and unceremoniously evicted the bluebirds. The Western Bluebirds (among the most lovely of species) are not aggressive enough to ward off the interlopers. Titmice and House Wrens are the main competitors to the bluebirds when seeking nesting space. 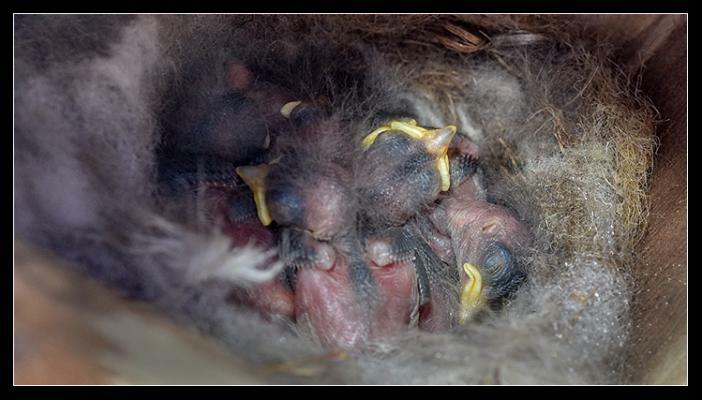 So, here are the recent Titmouse hatchlings. When taking photos like this we wait for the mother to leave the nest either for food, or carrying a "poop" sac before carefully opening the box, holding a mirror above the nest and quickly snapping a pic or two. Oh well, we'll have to wait again 'til next year. Thus the phrase, "hope springs eternal." How wonderful! Love our local wildlife. Titmice have used our nest box a couple of times. They are used to people, apparently, and one comes to pick peanuts off the table when I feed the jays! Such daring! Titmice are pretty nice birds too. Thanks for making the birds feel welcome. I built a small birdhouse last Fall and was surprised when an oak titmouse moved in a couple of weeks later. I hear her (him?) tapping on the side of the house and it sounds like someone is remodeling in there. I haven’t peeked inside. How wonderful to have babies in your nesting box. Thanks for showing us. I had a nesting box. The Bluebirds checked it out, but after a couple days they left. The Oak Titmice couple showed up, and spent several _weeks_ cleaning it out, but never nested. Never did the nesting box measure up for any species. You're very very lucky. Oak titmouse is one of my favorite birds. It is amazing, the variety in their calls. With one call they sound like a much, much larger bird. Thank you for providing shelter for them.